Take this utility building with you; use it as a garage, workshop, or storage unit. The 14 x 30 x 12 foot unit features polyethylene fabric that is fire retardant and UV resistant and uses heat welded seams for durability. The steel frame is pre-drilled and pre-cut with a galvanized finish; there are even wind brace supports at each corner. There are double zippered doors at both ends with a full-flap cover design to keep water and wind out. You can choose from forest green, tan, or gray to suit your style. 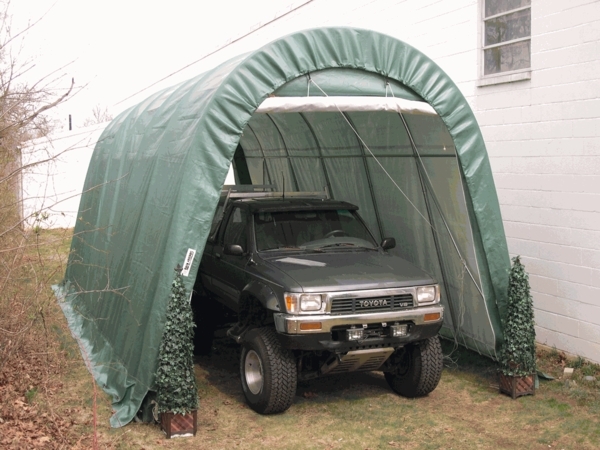 The ShelterLogic has a canopy 14' x 28' x 12' model, #95333. It shows the door opening measurements at 11.1 at the bottom, up 10 ft., and 8.4 ft. wide. This one is hard to determine. Do you have a measurement of the actual size (I am trying to fit my pontoon boat within the building)? The door opening will be 12' W x 10' H at the edges. I apologize, but we do not have a picture available. Can I see the instructions or a diagram of this shelter, please. I want to look at the framing to see how it would work for my project. Thank you. I need a 12 ft entrance and I'm wanting a 20 x 30 x 8 shelter. Can you help me? Is the 12' height of this shelter measured at the peak or at the bar at the top of the door opening? The 12 foot height is measured at the peak of the shelter. The width at the top is 12 feet and at the width at the bottom is 14 feet. The door rolls up to a 10 foot height. How wide is the opening at 7 feet high and then 8 feet high? My widest point needed is about 7 and half feet high for my boat. The door is 10 feet tall. The width at the top is 12 feet. The width at the bottom is 14 feet. I'm looking for a fairly permanent (5yrs) cover/tent for a sailboat. I need a 35' long x 12' wide shelter with a clear door opening that is 9' wide x 11.5' high. What would you suggest? What is the wind rating on this unit? What velocity wind can it withstand? Per the manufacturer, they cannot offer or guarantee snow load or wind resistance figures. However, reviews from customers who have purchased this type of structure report that it holds up well under normal to moderate inclement weather conditions. I have a vehicle that is 80" tall by 105" wide (with mirrors), 80" wide without mirrors. I need to know what is the height of the door and the width of the door at its top? Does your company give a military discount? Please contact customer service directly for this inquiry at info@ecanopy.com. Frame when up without a problem. Was expecting 2" Pipe got 1 1/2. Direction called for duck tape over bolt , a little late had canvas all ready on. Very poor job of installing grommets . 30 percent fell out while running the rope though them.